You’ve decided! 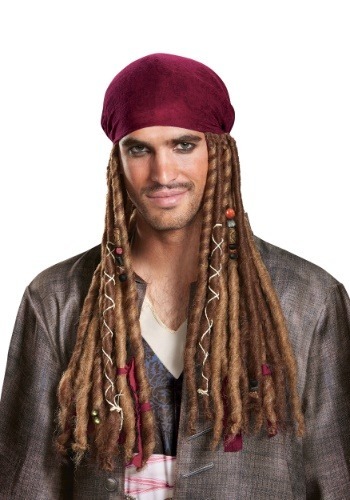 You want to dress up like Captain Jack Sparrow this year. Unfortunately, there’s just one tiny little problem. You don’t have months to grow out your hair into some gnarly dreadlocks like the famous Pirates of the Caribbean character. So, what do you do? You could sob hysterically, while creating a limerick about the unfairness of hair dynamics, cursing the cruelty of the hair gods… but we think you should just get this wig and bandana set instead. This officially licensed Pirates of the Caribbean accessory comes with a red bandana that looks just like the one worn by Johnny Depp in the classic Disney films. It also has plenty of dreadlocks made from synthetic fibers attached to it. That means you get to have some awesome dreads in just a few seconds. All you have to do is just plop it on your head. Praise the hair gods!